I had the opportunity to participate in the Finger Lakes 2012 Vintage Riesling Launch this past weekend, courtesy of the Finger Lakes Wine Alliance. Riesling Hour is a virtual annual event where participants gather across the globe to taste (and discuss) the current Riesling vintage. The event hashtag, #FLXwine, was the #2 trending topic on twitter that evening. Usually an active participant on twitter, I decided to host a private tasting this year. As a result, my tweets were few and far between (I haven’t quite mastered the art of tweeting, pouring and tasting). Renowned for their Riesling, the Finger Lakes growing land lies within a distinct geographic region just south of Lake Ontario in central New York. The deep Finger Lakes run north-south, providing prime grape-growing sites on their eastern and western slopes. 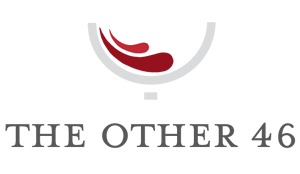 Lying at various elevations and distances from the water, the vineyard landscape provides for distinct sites and terroirs, all of which contribute to the range and complexity of their wines. 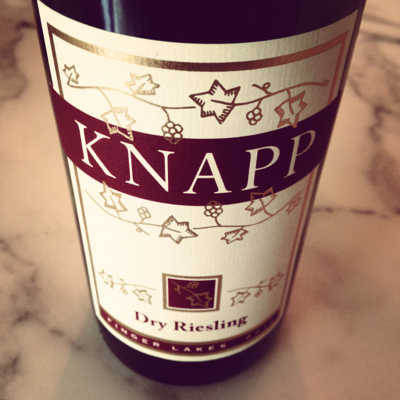 We started the evening with the Knapp Winery 2012 Dry Riesling. Crisp and lively, the dry wine paired nicely with our starter, pan-seared scallops. 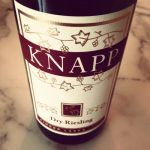 Located close to Seneca Falls, Knapp Winery & Vineyard has grown Riesling since its first vintage in 1983. 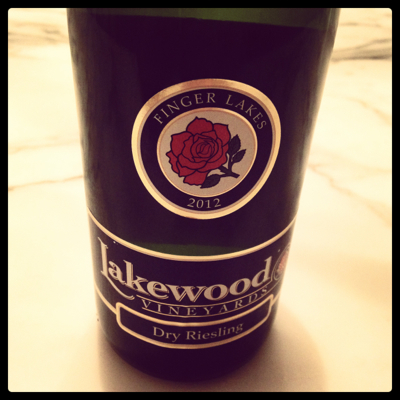 The second wine poured was the Lakewood Vineyards 2012 Dry Riesling. The family owned and operated Lakewood Vineyards was established in 1988. The 80 acres of vineyards includes some vines dating back to 1952, and currently consists of 14 varieties. Paired with pork, the nose featured floral and lemony citrus. On the palate, crisp minerality and acidity. At $13 retail, a solid value. 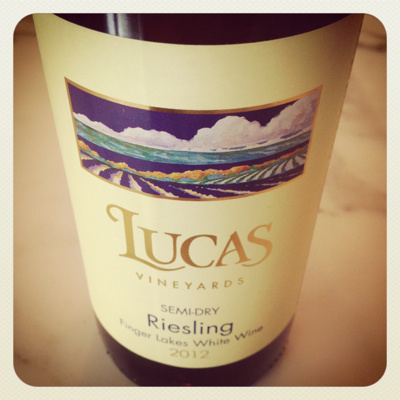 Last, but certainly not least, was the Lucas Vineyards 2012 Semi-Dry Riesling. A personal favorite of mine, no matter the vintage. Ripe peach and nectarine on the fruit-forward nose. Pear, apple and a twist of lime on the palate. Delicious and refreshing. A nicely balanced wine that proved popular amongst the group. In summary, Riesling Hour offers participants an opportunity to get an up close view of the current vintage, in addition to insight from the winemakers and winery themselves. And of course, let’s not forget the Finger Lakes, North America’s premier cool-climate wine growing region.